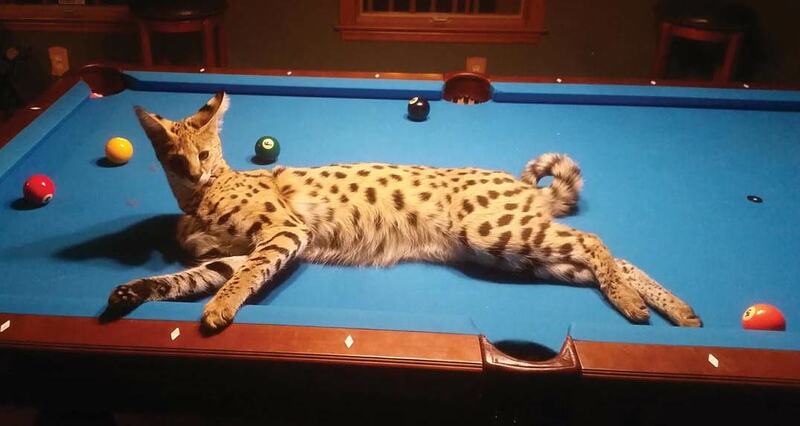 Zarathustra is an extraordinary feline, a Savannah cat as exotic as her name suggests. I met Glenn and “Zara” on a Sunday afternoon at Mount Pleasant’s Dog & Duck, where Zara was lounging in a patch of sunlight on the sidewalk, demurely ignoring the small crowd of brunchers hovering around her with their iPhones. Zara is happy to stay in the 3,000-foot enclosure Garritano built for her, complete with a carpeted slide and toy mice that he dangles from fishing poles. And he’s happy to share the intrigue of his exotic pet on outings, snapping photos with starry-eyed passersby who are surprised to find Zara at places like Mozzo Deli, one of her favorite watering holes. Glenn Garritano is nervous that someone will shoot his house cat, mistaking it for a jungle beast. His fear is not unwarranted. “They said she’d be afraid of people,” laughed Garritano, who adopted Zara from a breeder two years ago, “right after she came out of her mama” as he put it. He’s even designing a customized sidecar for his Can- Am motorcycle to give Zara a smooth ride. Zara saunters away from the mother-daughter duo cooing over her and jumps onto the hood of my Prius, hungrily eyeing the Porsche next to it. She is leashed to a tree, and Garritano keeps a close eye on her. Strapped to the back of her neon green harness, a mini GPS tracker transmits her whereabouts 24/7 to an app on Garritano’s smartphone. 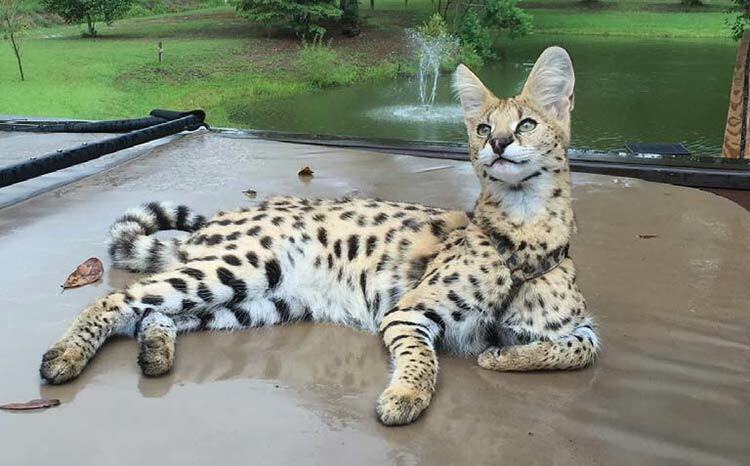 Savannahs are a hybrid of African servals and domestic cats, a cross popularized in the 1980s and lusted after by wealthy pet owners for its cheetah-like markings. Known for their dog-like qualities, Savannahs are loyal, playful, highly curious and social. They also cost tens of thousands of dollars. Domestic Savannahs are ranked by their serval lineage – basically, how close to wild they are, with F6 being the furthest removed and F1 the closest and most elusive. As far as Savannahs go, Zara is the only one in the Charleston region. You might have to go as far as Florence or Lancaster to find another. It is arresting to see her, looking like a mixture between a minicheetah and a lynx, on the windshield of a white Prius parked in Mount Pleasant. As an F1 back-cross, Zara is more than 75-percent serval – about as close as you can legally get to a wild African cat. She is more curious than vicious, and, while Garritano doesn’t recommend Savannahs as a pet for most people, Zara seems mostly harmless. Besides jumping on Porsches or nipping at one of the chickens Garritano keeps on his expansive property, Zara seems happy to sunbathe silently on patios while Garritano sips sweet tea. This cat is not unlike a dog, filling the role of both companion and prized possession. Zara is house-trained; she sticks her head out the window of Garritano’s truck; she eats raw chicken thighs (bone-in) or canned food he buys online for “less than Friskies at Wal-Mart;” and she cuddles on the couch. “I don’t let her off the leash because she’ll see something and run, and then I’ve got to run and I hate running,” Garritano laughed. It’s rare to see one of them without the other, though who’s leading who is unclear. Exotic pet shows or competitions couldn’t be less interesting to this duo. Zara is happy to stay in the 3,000-foot enclosure Garritano built for her, complete with a carpeted slide and toy mice that he dangles from fishing poles. And he’s happy to share the intrigue of his exotic pet on outings, snapping photos with starry-eyed passersby who are surprised to find Zara at places like Mozzo Deli, one of her favorite watering holes. Th is is the rare case where naming a cat Zarathustra is not overkill. Named after Zoroaster, the ancient Iranian prophet who mentored the three wise men in the bible, Zara even looks a little biblical. “She’s a cat, man. And she’s a chick. 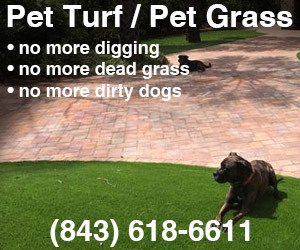 She’s got her own thing going on,” said Garritano. Like a feline Mona Lisa, Zara seems privy to this wisdom. Squinting in the sun, she looks as fierce as her F1 status implies. This is a cat who would punch her prey to death in the wild; not swat but hold down with one paw and punch into submission. But she is doing good deeds here in Mount Pleasant, laying docilely so diners at Dog & Duck can stroke her. Out of his mouth, Bengal sounds like a dirty word. 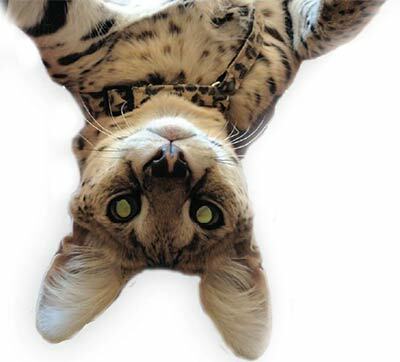 Garritano’s Zarathustra is nothing if not a proud Savannah cat.